This month the air is rich with the scent of soil broken open for planting in fields and gardens across the landscape. It’s a prime time to talk about soil health: how to achieve and improve it, and the positive impacts it can have on crops, livestock, and human beings. 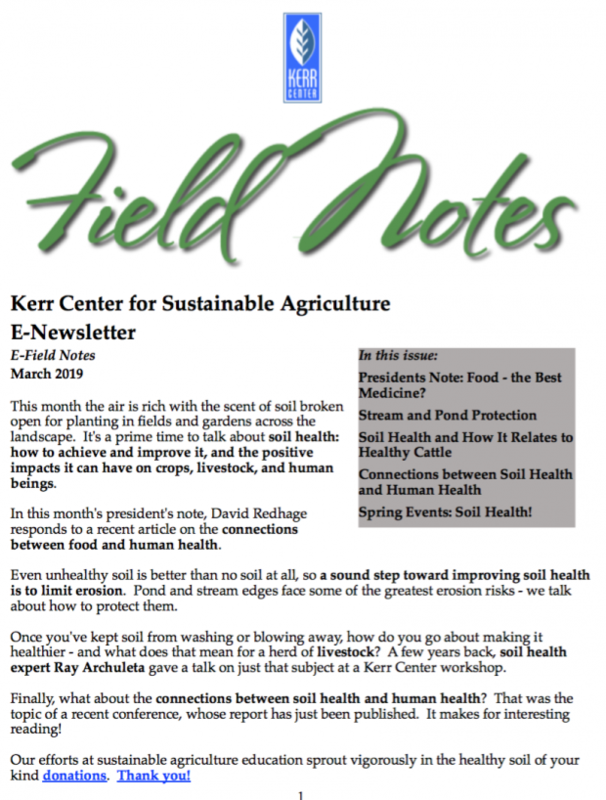 In this month’s president’s note, David Redhage responds to a recent article on the connections between food and human health. Even unhealthy soil is better than no soil at all, so a sound step toward improving soil health is to limit erosion. Pond and stream edges face some of the greatest erosion risks – we talk about how to protect them. Once you’ve kept soil from washing or blowing away, how do you go about making it healthier – and what does that mean for a herd of livestock? A few years back, soil health expert Ray Archuleta gave a talk on just that subject at a Kerr Center workshop. Finally, what about the connections between soil health and human health? That was the topic of a recent conference, whose report has just been published. It makes for interesting reading!